You will not regret giving this a go. If, like me, you suddenly and desperately need chocolate and can’t find any plus you are trapped with no shops that are close, this is your shiny knight. Just make sure you have about a cup of cocoa on hand. Everything else I reckon you’ll have in your pantry. And it’s easy. One pan, one cake tin. Eat alone, without guilt! Throw everything but your eggs and flour into a saucepan and warm. Don’t boil, just make sure the sugar has dissolved. Then simmer it for a couple of minutes. Cool this. Give it at least half an hour before you add the flour and eggs so that you don’t cook the eggs. I buttered, floured and lined whatever small round tin I could find. I guess it was 8-9”. I baked for 40 mins at 180 degrees celsius on normal convection and it was perfect and after five mins cool down, tipped out of the tin easily because I’d taken the trouble with prepping the old tin well. After cooling to cold I iced. 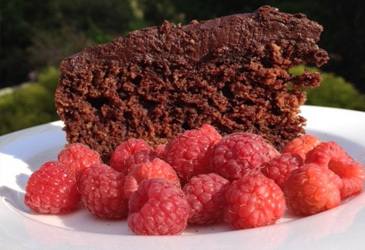 And then I ate it in desperation and my family agreed it was perhaps the lightest, most delicious, most chocolatey cake I’d ever made.